This recipe is a new favorite, especially paired with a cup of piping hot coffee in the morning. Recently Cameron’s Coffee reached out to me about sharing their coffee with all of you. Have you tried it before? We’re kind of obsessed over here. Abra and I have been sipping on their coffee both in the mornings and afternoons. I grind the Cameron’s beans in my vintage coffee grinder (found at a flea market in New Mexico!) and quickly the wonderful, strong coffee aroma fills the kitchen. We all know that smell all too well. Let’s be honest — waffles and coffee = the best start to your morning. They have a really amazing farm to cup story: Cameron’s invests and protects farming communities by minimizing water and energy waste for the earth. Learn more here. Cameron’s has created single serves with filters instead of plastic cups. They’re called Better Brew Eco Coffee Pods and they are awesome. Just think: What if you could have the same convenience of a K-Cup®, and you had a better tasting coffee that used renewable plant based materials? Cameron’s has introduced single serves that work in your Keurig® and use compostable materials. Cameron’s is affordable, and still high-quality. Cameron’s only roasts and packages coffee for people to buy at their local store and bring home to enjoy. Most other coffee companies have coffee shops, but Cameron’s makes coffee for you to enjoy every morning at home. Anyway, these waffles are made in the blender with simple ingredients like mashed sweet potato for fiber and vitamin A, cottage cheese for protein, and oats for complex carbs. Bonus points: there’s nearly 20g of protein per waffle, so they’re bound to keep you full until lunchtime. 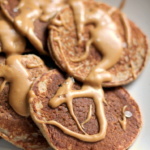 Top with a drizzle of peanut butter for the best post workout breakfast ever. So guys, what are you waiting for? Coffee & waffles are on the menu. xo! Oh, and happy love day to all of you. Place all ingredients in a high powered blender and blend until batter is smooth. Batter will be somewhat thick. Spray waffle iron with nonstick cooking spray and cook according to waffle iron directions (about 3-4 minutes). Makes 2 large waffles. Top with greek yogurt, nut butter & maple syrup, if desired. Enjoy with a cup of coffee. This post is in partnership with Cameron’s Coffee, a brand I trust. Thanks for supporting AK and the brands that help make this site possible! 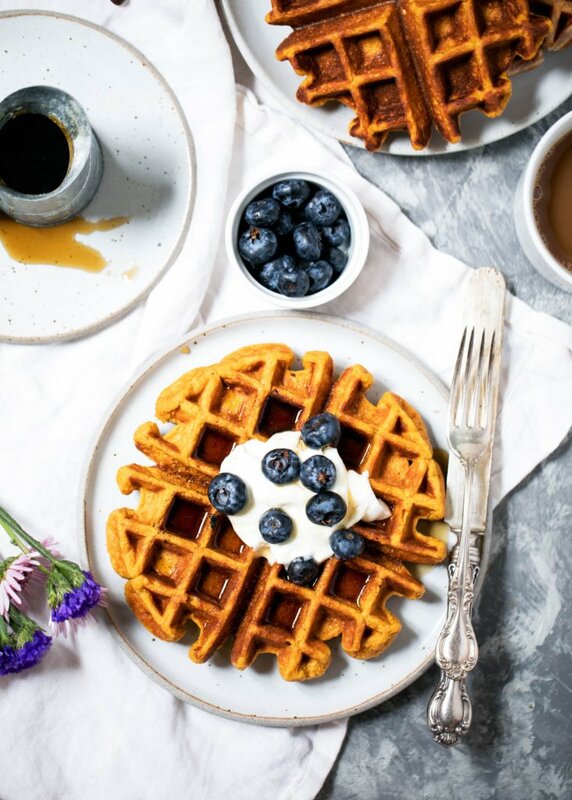 51 Responses to "Maple Cinnamon Sweet Potato Protein Waffles"
These sound awesome! Gorgeous photos too! I am not a big fan of cottage cheese. Just out of curiousity, does it give the waffles a distinct flavor or is it used for texture purposes? It’s just used for a boost of protein. You won’t be able to tell that it’s in there! Would plain Greek yogurt be a good substitute for the cottage cheese? 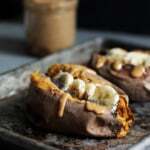 Do you cook a lot of sweet potatoes ahead of time and keep them in the fridge? I notice that a lot of your recipes have cooked sweet potatoes and I don’t find them in the jar like pumpkin. I just wondered if you did and how long they store for? My kids are not going to wait around in the morning for me to bake the sweet potatoes up and then make waffles….. 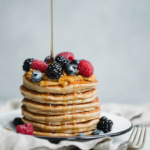 These waffles are so packed with protein and vitamins- love how they could probably fool kids too 😛 Need these with a dash of greek yogurt and maple syrup…yummmm! I keep sweet potatoes in my fridge already roasted! I roast them on Sundays when I am doing other meal-prep since they don’t really need any attention. Then I wrap them in foil and use them throughout the week, either re-heated real quickly in the microwave, or in smoothies, yogurts bowls, and now, these waffles i want to try! i forgot to add- in foil in the fridge! Cook them ahead of time. I usually roast them in the beginning of the week, then wrap in foil and keep in the fridge. They last up to one week and are perfect for adding to smoothies, salads or baked goods! 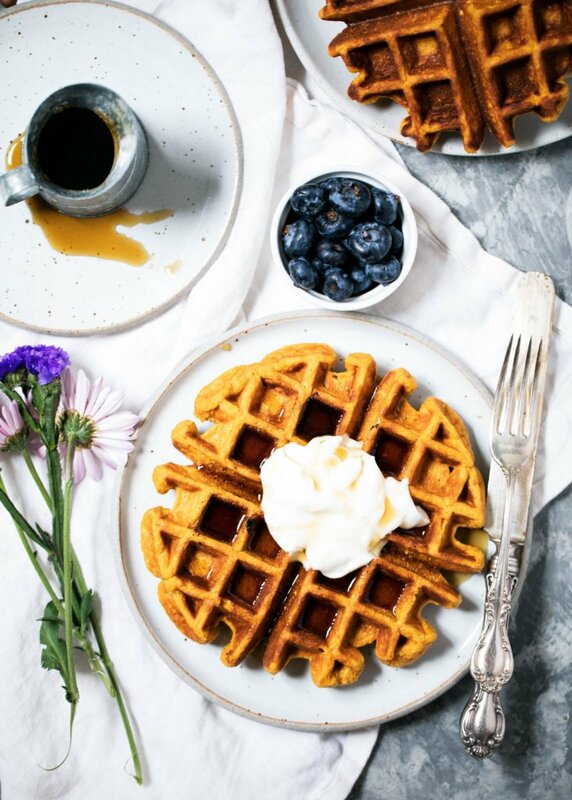 Sweet potatoe waffles sounds very interesting. But they do look amazing!! Hi! Do you have any suggestions for a dairy free option? These look amazing but I don’t consume cow dairy. I don’t, I’m sorry! I haven’t tested them any other way. Would these work as pancakes? They look amazing but I do know a waffle iron. Thanks! i’m not a huge fan of cottage cheese plain, but i love it when it’s blended into other things! sounds like such a good way to add more protein to waffles. I got to try this yum. These look fabulous!!! I noticed some people asking about sweet potatoes. If you roast them in your oven they will keep for a while in the fridge or you can store in the freezer measured out for what ever your favourite recipes call for. I do this with brown rice, quinoa and barley so that I always have a healthy side or ingredient for my meal prep. I measure out the cooked quinoa in 1/4 cup portions and wrap in plastic wrap and store in a freezer bag and the other grains I just eyeball how much I would use for a meal and store in resealable freezer bags as well. Makes life much easier as you only need to add protein and veg. It is a great time saver. Love how simple the ingredients are for these delicious-looking waffles. 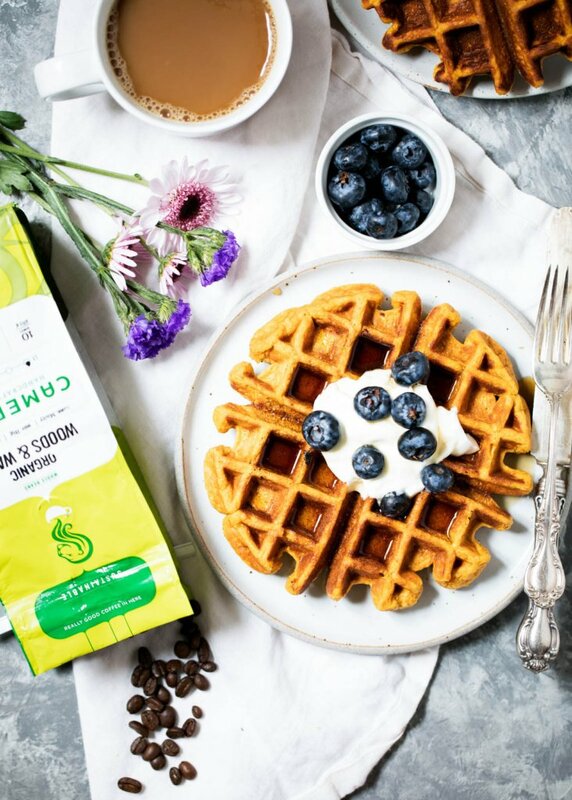 I’ve never added cottage cheese to waffles before but now you’ve got me wanting to try it! 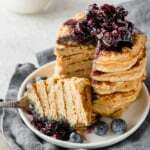 Could I make pancakes using this recipe as I don’t own a waffle iron? Thank you, they sound delicious. I love that these have extra protein without protein powder. Also, I bet they would be great with mashed sweet potato made in the microwave. That is what I plan to do for quickly prepping the sweet potato. I have everything for these except cottage cheese or I’d be making them for breakfast right now! Bummer. But I will be this weekend they look amazing! Do you think Greek yogurt would work instead of cottage cheese? Little too much sodium in the cottage cheese for my diet. Hi! I tried making these waffles today and I had the waffles stick to the waffle iron. I tried again same thing! Not sure what I’m doing wrong! I made some of the batter as pancakes it’s amazing! I sprayed the waffle iron with Pam. I tried this recipe this morning as a saturday breakfast treat, was sooo delicious! I made it as a pancake as i dont have a waffle iron, the extra treat was having it topped with nut butter and nutella! So yummmy! Just wanted to share that i successfully made these vegan! Replaced the egg with flax egg and the cottage cheese with white beans and almond milk… might need little more salt added but it came out great! It’s going to change the nutritional information but should maintain some decent protein!! That’s awesome, Melissa! So glad those substitutes worked out for you. And yes, it sounds like they’ll still have a good amount of protein! I never EVER have good luck with gluten free waffles. They always stick to my waffle iron. I just made these and they are AMAZING. I love that these are full of protein ❤️ I can only eat eggs if they are baked into something else and make up a very small portion of the ingredients, so I am very excited to have a protein filled breakfast that I can eat. Thank you! 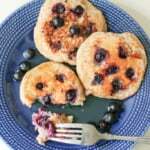 Have made these twice now, they turned out delicious both times, I used greek yogurt instead of cottage cheese, worked well! 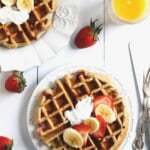 One of the best base waffle recipes! So happy to hear that, Tanya! Love these.